When you cast on with the two-strand method in knitting, you need only the RH needle. The two-strand cast-on method (or long-tail method) is a great all-around cast-on for your knitting repertoire. This cast-on method is elastic, attractive, and easy to knit from. 1Measure off enough yarn for the bottom part of your piece and make a slip knot on your needle. 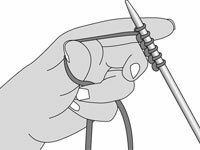 To make the slip knot (the first stitch), make a pretzel-shaped loop and place your needle into the loop (a.) and pull gently on both ends of the yarn until the stitch is firmly on the needle (b.) but still slides easily back and forth. To figure how long the “tail” should be, you need approximately 1 inch for every stitch you cast on, plus a little extra. Alternatively, you can measure the bottom of the knitted piece and multiply this number by 4. 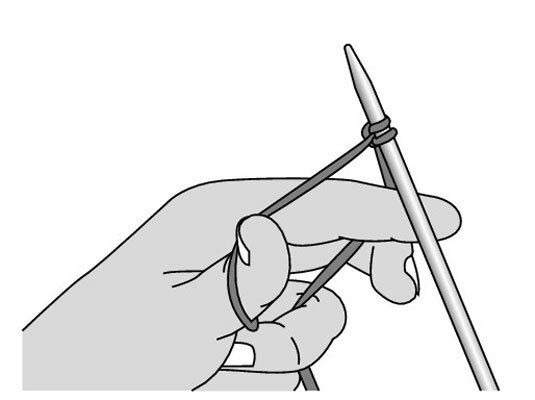 2Holding the needle in your right hand with the tip pointing away from your hand, insert your left thumb and index finger into the “tent” formed by the two yarn ends falling from the slip knot on your needle. This position might seem a bit awkward, but it’ll be second nature when you become a knitting know-it-all! 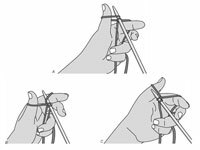 3With your left hand’s ring and pinkie fingers, catch the yarn ends and hold them to your palm. This step prevents the ends from flapping around as you work. 4With your right hand, pull the needle between your left thumb and index finger. You don’t want the “tent” sides to be droopy. 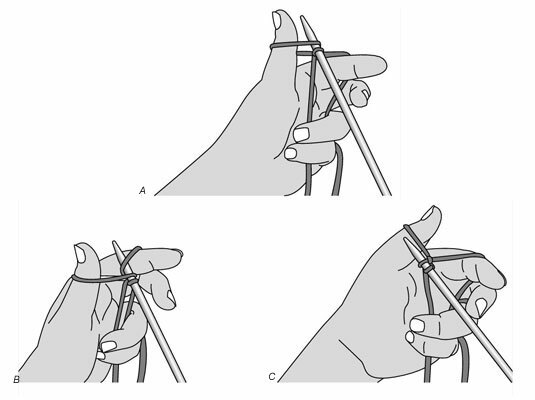 5With the needle tip, go around the yarn on your thumb from the left, as shown in (a), then go around the yarn on your index finger from the right (b), and pull the new loop through (c). This looks complicated, but you’ll get the hang of it. 6Tighten this new loop (your first cast-on stitch!) onto the needle — but not too tight. 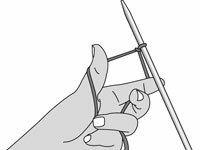 If you don’t let go of the yarn after creating the stitch, you can use your thumb to tighten the stitch onto your needle. 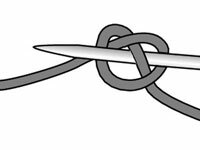 Although this is your first cast-on stitch, it’s technically the second stitch on the RH needle; the initial slip knot counts as the first real stitch. 7Repeat Steps 5 and 6 until you have the number of stitches you need. 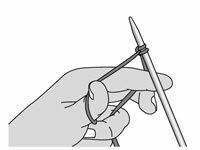 If you need to put your work down, or if you lose your place, you may have to pull the stitches off the needle and start from Step 2 again.